The KanteleDuo Matti & Sinikka Kontio was founded in 1990 and is dedicated to music based on the Finnish folk tradition. Its repertoire includes very old, traditional tunes from eastern Finland performed on an instrument of small size, as well as Romantic folk songs from the 19th century, in addition to contemporary music written for the modern concert instrument. The kantele - a plucked instrument of the zither family - is Finland's national folk instrument. 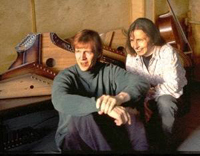 Sinikka and Matti Kontio are two of the leading figures in Finnish kantele music. Sinikka Kontio (Järvinen) is a musician, while Matti Kontio works as a composer and performing musician.